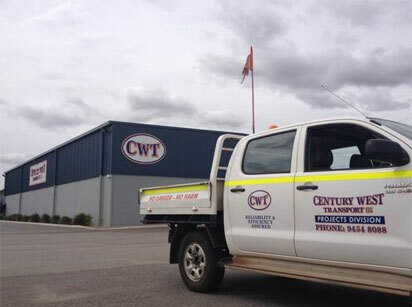 Here at Century West we have a history of supplying logistical services to large project works throughout Western Australia and in the Eastern States. In 1978 Haydn Reynolds (Managing Director) was able to secure work with Vinidex (Pipe Manufacturer) as a subcontractor. From that time on and through the past 35 years Haydn has provided not only his service as a subcontractor but provided Vinidex with specialized assistance and equipment to progress their service levels to the clients of Vinidex. This development led to an increased fleet of specialized crane trucks, delivery trucks and semi trailers over the ensuring years. Due to the design and provision of custom built trucks and trailers to enhance the productivity by increasing loading capacities ,Haydn allowed Vinidex to extend their service levels to their clients by the transport of increased load volumes in a safe manner. As a result of this specialized development it was a natural course of events that Century West developed a separate division of the company to supply services to other companies especially in the Resource Industry of Western Australia wanting to be a part of a company with the philosophy to think outside the square and not be afraid of new dimensions within the transport sector. From this move, Century West Transport developed a Project Division focused on supplying the client with a complete package relating to their individual needs, be it discharge of shipping vessels, supplying and managing storage yards, supply of cranes and forklifts and the subsequent transport to the final destination (See Projects Completed). 2011/2012 Streicher Clough/ BHP Macedon Load and Transport of 84 kilometres of 18m gas pipe Dampier to Onslow including string out of pipe. "Haydn Reynolds and Century West Transport have partnered with Vinidex for over 35 years. We rely on Haydn and his team for our key local, northwest and interstate freight operations, providing Vinidex with over 1.5 million kilometres of transport every year. Their service, attention to detail and reliability means that our requirements are always met. We consider Century West Transport part of the Vinidex team and key to our customer service."